6 Temperatures Settings Kettle: The electric kettle has 6 temperature choices(160℉, 175℉, 185℉, 190℉,200℉,212℉), it allows you to choose the most suitable temperature to boil up water, brings out the best in your favorite teas and coffees. It has 6 colours of lights in the water indicator window, the lights changes as temperature changes. With the option of 30-minute keep-warm function, it can keep your water at your preferred temperature. 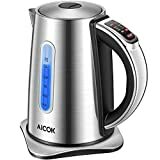 Fast Boil Electric Tea Kettle: Only have a few minutes for the break? Want to enjoy your afternoon tea time soon? 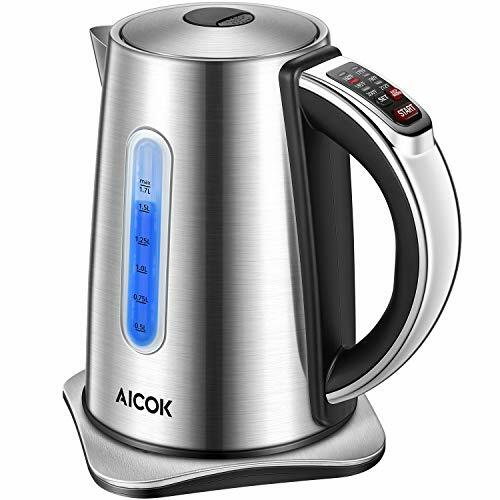 Aicok temperature controlled electric kettle helps you solve these troubles. With 1500W heating power, the kettle comes to boil up faster than other 1000W kettles, even with 1.7L water. Double Sides Water Window: The hot water kettle electric has colourful lights in the water indicator window, the light turns off automatically when water reaches the set temperature, it's easy to know if the water kettle finishes working. The water window is on both sides of the kettle, easy-view water window helps you clearly know how much water is left no matter from any direction. Stainless Steel Tea Kettle: Made of food-grade brushed stainless steel, feel free to prepare healthy hot water and delicate drinking for your family. 304 stainless steel promises you a durable and easy cleaning warranty. Stainless steel square power base is more durable and stable than other round plastic bases. Auto Shut-off: The water kettle switches off by itself when water reaches the desired temperature, max protection to avoid dry boiling. Extended to 24-month quality warranty, welcome to contact us if you have any problem, 24/7 customer service is always online.